It can be frustrating when trees and shrubs fail to establish well. The main symptoms of poor establishment are yellow or brown leaves and shoots dying back. There are steps you can take to remedy the situation, but it is better to try to prevent these problems happening in the first place. In most cases, trees and shrubs will establish well, with no problems as long as root health, weather, soil conditions and the aftercare provided are favourable. If one or more of these factors are unfavourable, trees and shrubs may fail to establish, often within the first two years after planting. Although they may show some signs of growth, the foliage of trees and shrubs that are struggling to establish may begin to deteriorate, often in early summer, with leaves turning yellow or brown, shrivelling and falling. This can take place over several months or quite suddenly. Bare-root trees and shrubs lose most of their root system when lifted for transplanting. They have to grow new roots to survive. For these plants to survive, post-planting irrigation and weed control are crucial. Remedy: Water newly planted trees and shrubs well, remembering that soil may be dry around the roots even when the surface appears moist. Weeds compete with plants for water, so keep a vegetation-free circle at least 1.2m (4ft) in diameter around the plant for its first three years to help avoid this problem. Inadvertent frosting, waterlogging or drying of roots before planting reduces the chances of success. Remedy: Keep newly purchased plants in a cool, but frost-free place, with their roots covered, until you can plant them. Plant bare-root trees and shrubs as soon as you can. If you can’t plant them straight away, heel them in until planting is possible. Container-grown trees and shrubs retain their root system, but container cultivation can lead to congested, curled roots which often fail to grow out into surrounding soil. 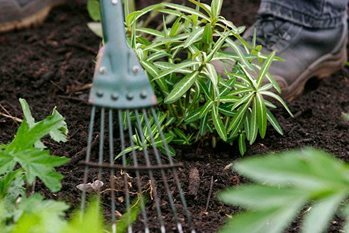 Remedy: Dig up the plant and uncurl the roots, cutting them if necessary, and spread them out in a new square planting hole. Try to avoid buying pot-bound plants, which are recognisable by a mossy covering to the compost and congested roots when tipped out of the pot. Insufficient watering in the first two years after planting is the main cause of poor establishment. Nearby trees, shrubs and hedges can also cast a rain shadow. They also have thirsty, wide-ranging roots, leading to greater watering requirements than expected. Remedy: Check moisture levels around roots with a trowel. Watering to soak the root zone requires at least the equivalent of four watering cans per square metre. Weeds, lawns and other vegetation intercept water before it reaches the roots. Remedy: Keep a circle at least 1.2m (4ft) in diameter around the base of the plant that is vegetation free for three years after planting, using hoeing, weedkillers or mulch. In hot, dry weather, plants lose moisture very quickly. Remedy: Cover the bare area around the base of the tree with a mulch of plastic sheeting or organic matter to help retain moisture and suppress weeds. Thick, coarse organic mulches are ideal, cooling the root systems and improving soil structure over time to create a well aerated but moist area where roots can survive winter waterlogging. Poorly drained or waterlogged soil will kill many trees. Remedy: Improve drainage where possible by aerating the soil around the tree with a fork. In future, select trees with better tolerance of wet soil conditions, or try planting on a slightly raised mound, about 25-30cm (8-10in) high. Overwatering is as detrimental to tree establishment as underwatering. Remedy: After the initial watering-in, check soil moisture frequently (once or twice a week) but only water again if the soil is starting to show signs of drying. Less water is needed in still, dull weather conditions than in hot, windy ones. Positioning the tree too deep in the soil can lead to stem rotting and tree failure. Remedy: Scrape away surplus mulch and/or soil from the case of the trunk. In severe cases of deep planting, the tree may need to be lifted in the autumn and repositioned higher in the soil. When replanting, ensure the first flare of roots sits just below the soil surface, avoiding burying any of the bare stem. Keep mulches clear from the immediate base of all trees and shrubs. Roots fail to grow outwards into the surrounding soil if the soil is compacted. Remedy: Fork through a ring of soil just to the outer edge of the rootball. Most new root development of trees and shrubs in the UK is out laterally into the surface layers or soil rather than straight down. It is therefore important than the soil in this zone is sufficiently loose and aerated to allow for easy root development. Wind rock of unsecured trees and shrubs can damage roots and lead to water collecting in the ‘socket’ caused by the stem moving at soil level. This can lead to fatal rotting. Remedy: Staking avoids this, but stakes should be no taller than one-third of the stem height and must be secure. Avoid excessively tight tree ties when securing stems to stakes, prevent rubbing of stems against stakes and ties, and remember to progressively slacken the ties as the stems grow. Windbreaks may be required in very exposed sites. Although a lack of nutrients is seldom involved in establishment problems, it is worth applying a nutrient or fertiliser to the leaves (foliar feeding) in order to get some nutrients into the plant, even though its roots are not fully functional. Remedy: Use special fertiliser formulated for foliar feeding, and spray in overcast weather to avoid scorching the foliage. Make sure to spray the undersides of the leaves as well. Fertiliser top dressings in late winter or early spring are worth trying where other factors are clearly not to blame for poor growth. Although larger-sized specimen trees and shrubs can be perfect for making instant impact or screening, they are naturally more prone to poor establishment. This is because the root system is invariably undersized compared to the amount of top growth. They will require greater aftercare than smaller plants, especially with attention to watering. Expect it to take two or even three seasons for specimen trees and shrubs to be fully established.